Nicolas De Lyra (ca 1270-1340) was a French exegete in the Franciscan order. He was born in Lyne in Normandy and became a Doctor of Theology and teacher at the Sorbonne. He was noted for his extensive commentary on the Bible. 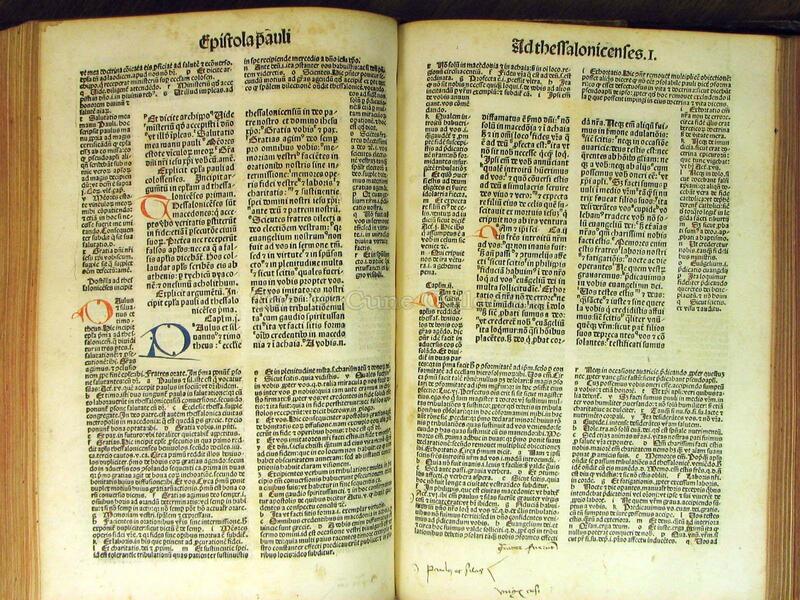 Martin Luther is claimed to have stated “Without Lyra we would understand neither the old or new testament.” De Lyra was the first printed biblical commentary. 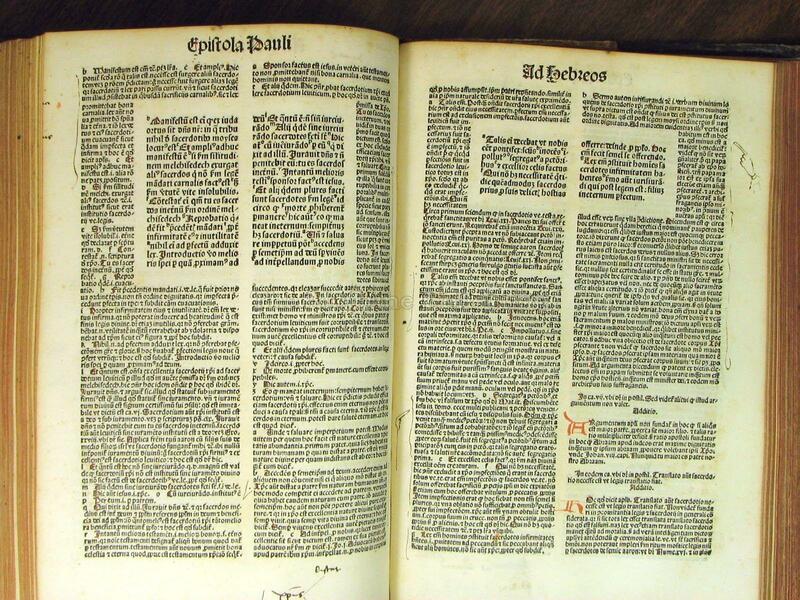 He was a scholar familiar with Hebrew and stressed the need to go to original sources for books of the Bible rather than rely on corrupted Latin versions prepared later. He made use of the Talmud, other Jewish writings of rabbinical scholars, especially Rashi (Solomon Ben Isaac) of the 11th century, in order to understand the Jewish practices. 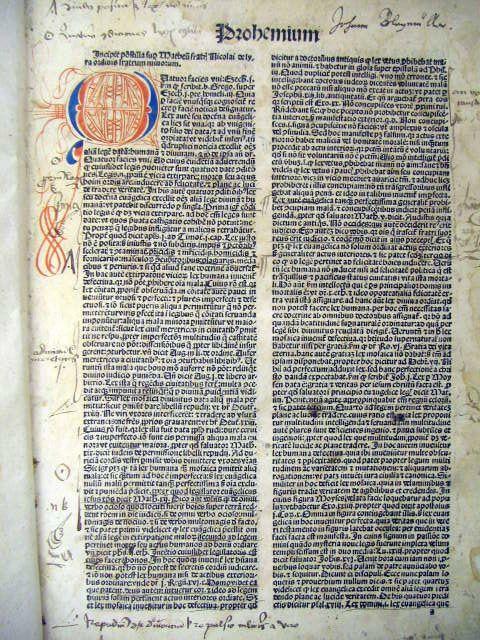 Most of all Nicolas De Lyra always emphasized the literal meaning of the passages in the Bible rather than the mystical or allegorical explanations that had developed. This is volume four (the New Testament) of a four volume set of the Bible. 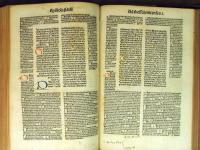 The text of the bible is given in the center of the page and the commentary by De Lyra is in smaller text on the left and right of the columns. 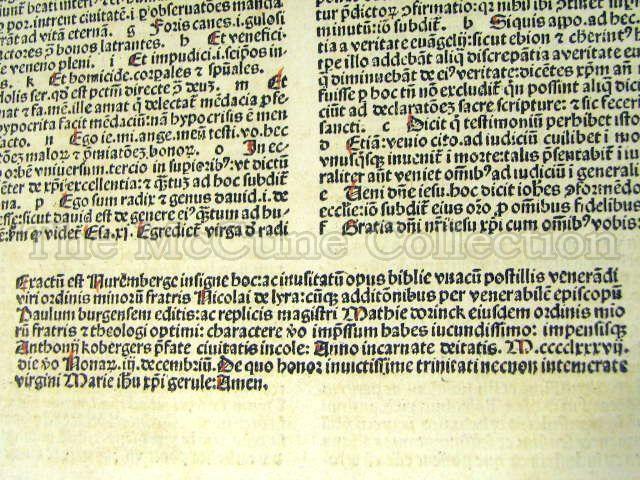 The biblical text is printed in double columns in gothic type surrounded by extensive commentary printed in smaller Gothic type of 72 lines per page. 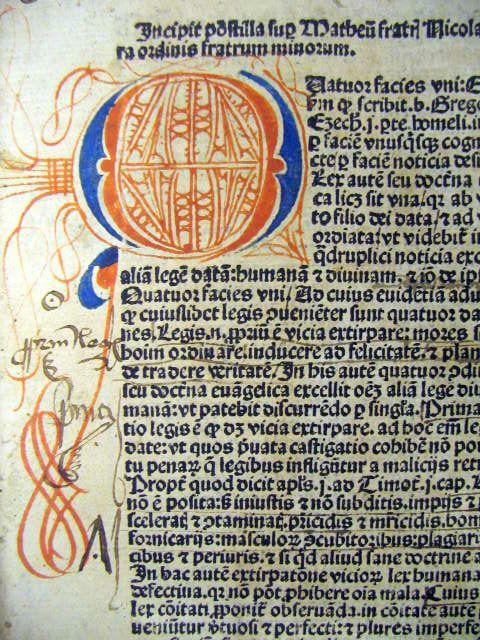 The first initial (10 line) in the book is an elaborately decorated “O” in red and blue with a cadel on the left margin and abstract linear embellishments in the center. There are quire signatures. Notes and doodles are found in the margins. Anton Koberger (ca 1440-1513) was a goldsmith in Nuremberg. He was the godfather of Albrecht Durer. 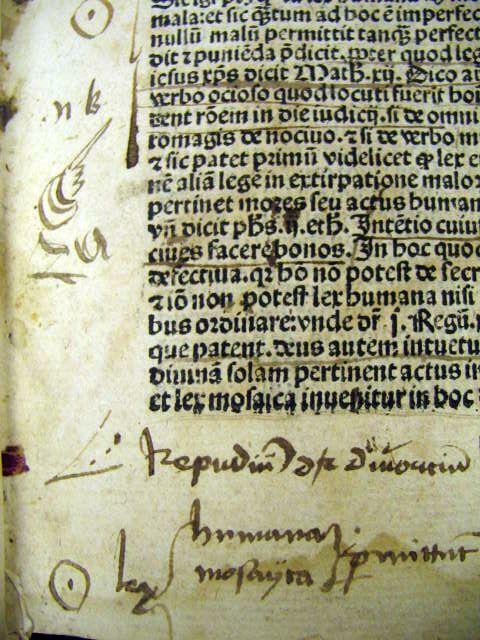 Koberger turned to printing in 1470 and soon established the largest printing house in Europe, employing over 100 workers and 24 printing presses. 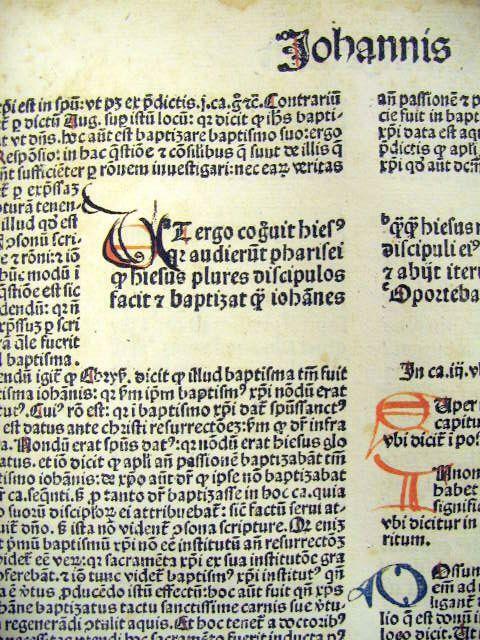 In addition, he often contracted with other printers, including Adolf Rusch of Strassbourg and Jacob Sacon of Lyon, to do additional printing work. 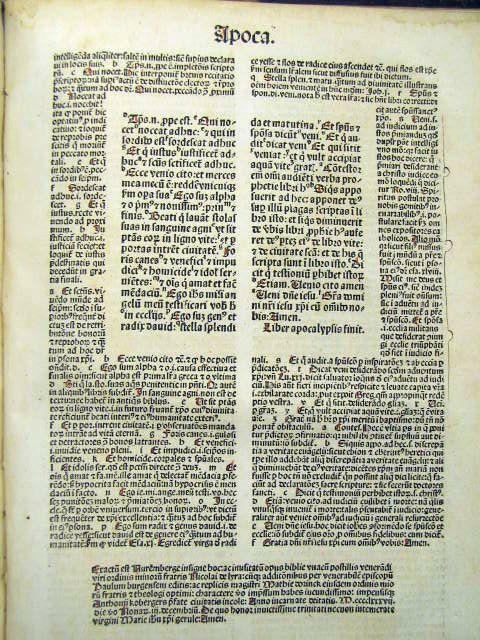 Koberger printed over 200 titles of incunabula, including 15 different copies of the Latin Bible. His most famous work was the illustrated Nuremberg Chronicles which he published in 1493 in both German and Latin editions. 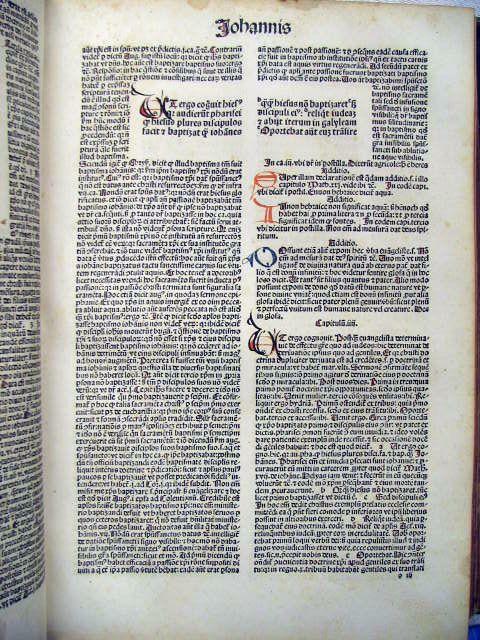 It is believed he printed over 1000 copies of each at a time when most printers issued editions of only 300 copies. 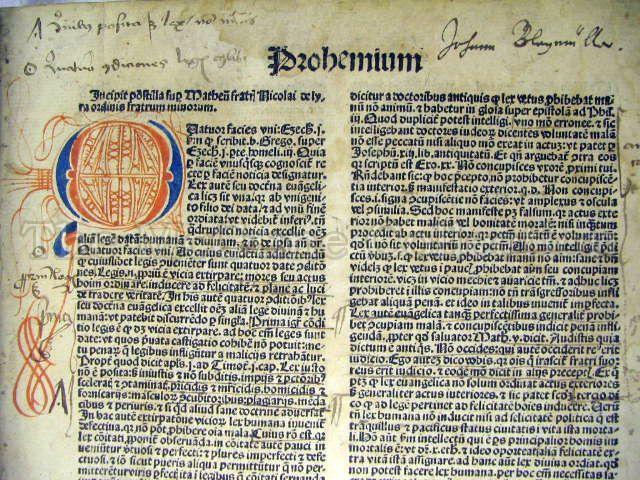 It is said that his only business blunder was when he turned down Martin Luther’s request to become Luther’s publisher.